CONNORVILLE — Tori Luyster belted a walk-off two-run double with the bags juiced and no one out in the bottom of the seventh inning Tuesday afternoon, lifting Buckeye Local to 7-6 victory against River under crystal-clear skies at the Panthers’ softball complex. Luyster’s blast capped a six-run rally for the hosts, who trailed by five heading into the home half of the fifth and two into the seventh. Trailing 6-4, Jordyn Spencer started the Panthers’ seventh by doubling to left. Then, with Brooke Miller at the plate, Spencer moved to third on a pass ball. With Miller reaching on a walk and Ashley Burkett at the dish, River head coach Dave Wright replaced Pilots starter Izi Swords with Katie Lively. Burkett reached on an infield single, loading the bases. Alaire Destifanes followed with a hit to the outfield, scoring Spencer, making it a one-run game. That brought Luyster to the plate, and the senior delivered with a shot to right that drove in Miller and Burkett with the tying and game-winning runs, respectively. 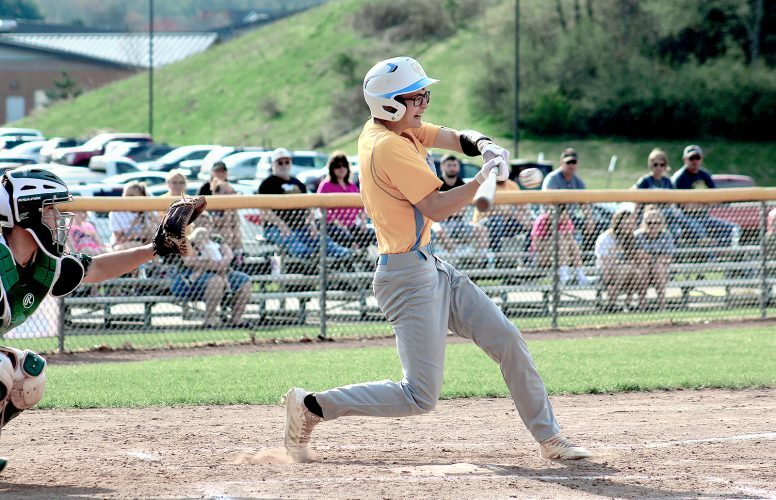 The Panthers recorded eight of their 12 hits during the final three innings, including four in the decisive seventh. “We had our lineup right where we wanted it,” Soos said of the seventh. “Burkett has been hitting about .380. Tori’s batting over .400. We had the right kids up. Miller is batting around .380. That part of the lineup is pretty strong. The Pilots (12-9) surged to a 3-1 lead behind single runs in the first three innings. In the fifth, though, River finally produced an offensive output off Luyster, who came in in the fourth, behind the top of its lineup. Leadoff batter Riley Lollathin singled to start the inning, stole second and moved to third on a wild pitch. Katie Rufener walked. Then, Candace Caldwell cleared the bases with a single to center, making the score 5-1. Livi Rose followed with another RBI base knock. Buckeye Local matched River’s output in the bottom of the fifth. Burkett keyed the effort with a two-run single, followed by a groundout from Destifanes that scored another. Lillie Windsheimer plated the Panthers’ first run in the second from the eight hole, part of a solid effort up and down the lineup from Soos’ club. “You have to take your hats off to our kids,” Soos said. “They’ve been putting up with a lot of bad karma; a couple of bad breaks in games. Big win. It’s momentum. RIVER: Swords (2K, 1BB), Lively (7) lp (0K, 0BB) and Rufener. Caldwell 2S, 3rbi; Rose T, 2S, 2rbi; Huffman S, rbi. BUCKEYE LOCAL: Basich (1K, 1BB), Luyster (4) wp (5K, 1BB) and Spencer. Spencer 2D; Burkett 2S, 2rbi; Destifanes 2S, 2rbi; Luyster D, S, 2rbi; Windsheimer 2S.